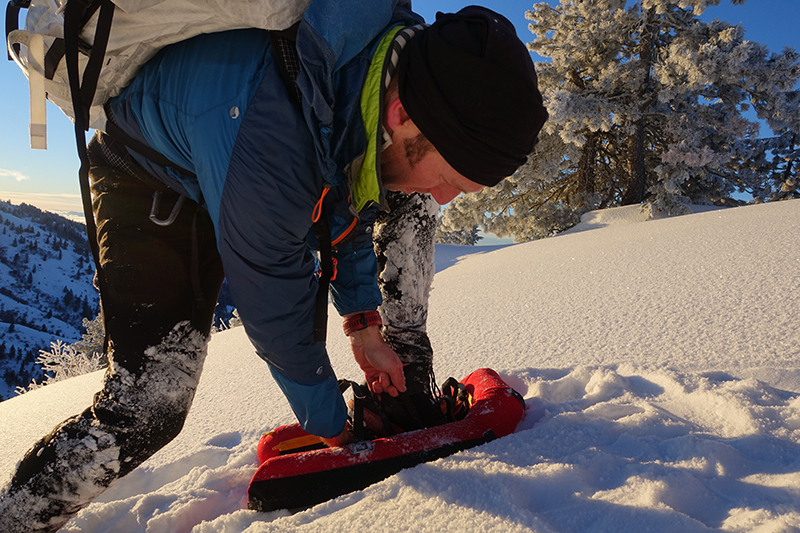 These inflatable snowshoes weigh under three pounds a pair and each packs down to the size of a one liter Nalgene bottle. Meet the Small Foot Revolution. Bounding through the snow covered canvas, my headlamp cuts a hole through the frosted forest, illuminating the path of least resistance. 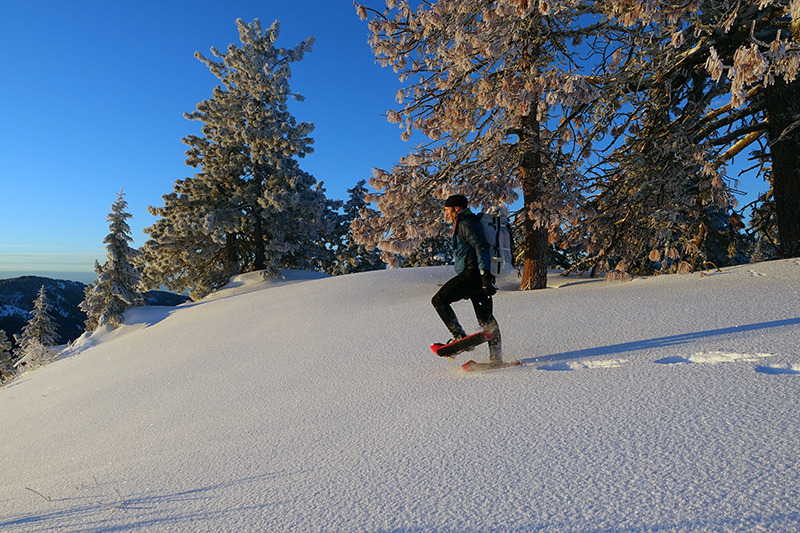 I’m not skinning up on skis, but instead wearing a new kind of inflatable snowshoes…and loving it. 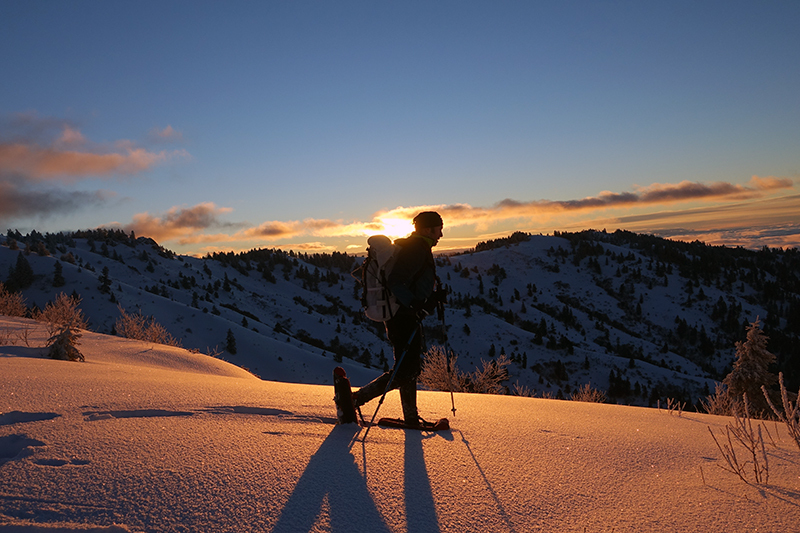 Snowshoes have had a relatively linear evolution. Sure, we’ve seen new materials — aluminum, plastics, carbon fiber — but fundamentally, the snowshoe has been built on the same rigid frame since Fred Flintstone strapped into his yabba dabba shoes. That is until now. 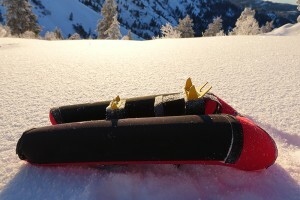 Last October we shared Bulgarian-based Small Foot’s Kickstarter campaign that ushered this inflatable snowshoe to market. The campaign was a success and the first shoes from this campaign are just now being sent to backers. We just got our hands on a pair and have been testing them this winter. 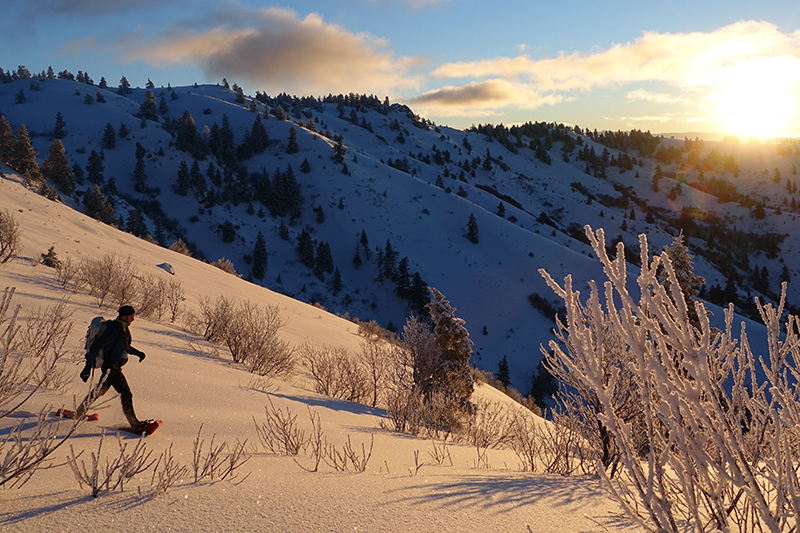 The third in the Small Foot lineup, the Revolution snowshoe is based on the same principle as the original models. 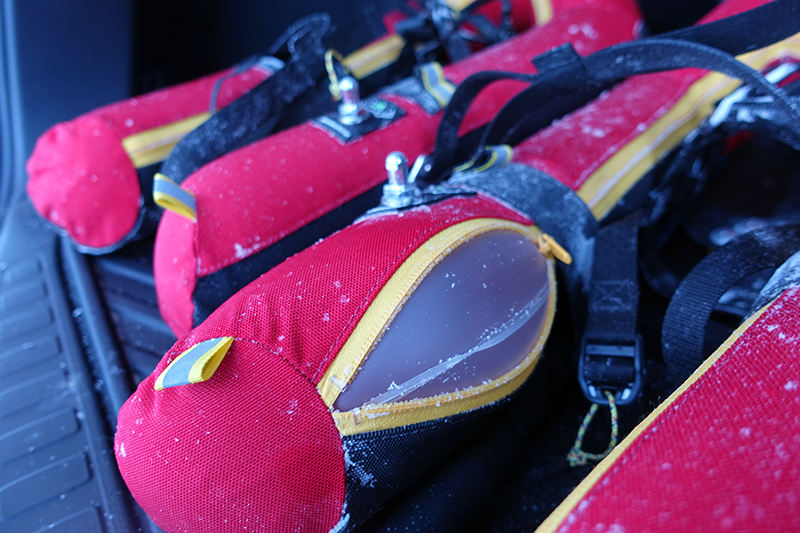 A rubber air bladder slips onto a Cordura sleeve, which zips shut around the inner side of the snowshoe. Your foot is cradled by three straps: two that cinch down over your foot’s toe and throat and a third that snugs behind the boot. While not imperative, you’ll get a better fit if the boot has a lug or tab to keep the straps from slipping off the backside of the boot. The seams and underside are protected by a heavy-weight Cordura, buffering the shell from abrasion. The shoes come with a traditional bike pump that couples to the metal Schrader valve. If you can fill your bike tires up with air, you can inflate the Small Foot snowshoe. It took about 90 seconds to inflate each snowshoe. The Small Foot weighs about 21 ounces per shoe and is available in size medium and large to fit feet form size U.S. 4-13. 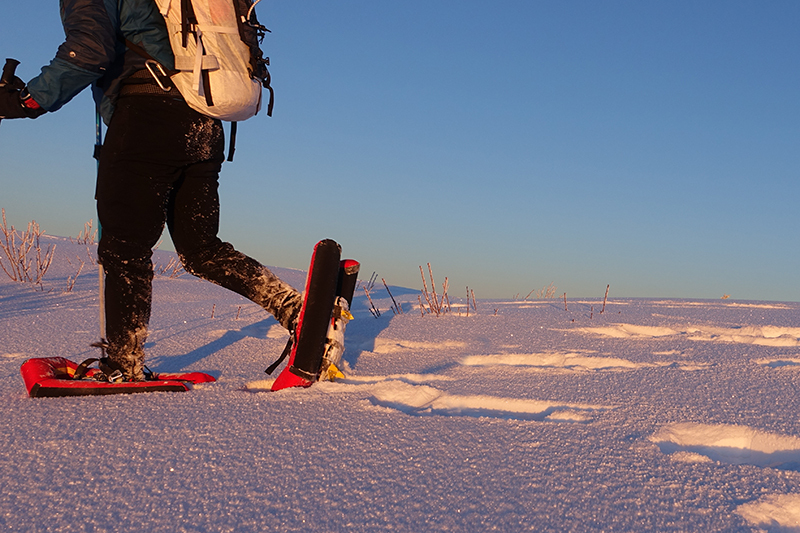 Two rows of coated crampons lay under the foot — one under the toe and a smaller second row under the heel. The coated metal bites well and does a relatively good job tracking up steep snow. The free heel hammock design allows the foot to pivot for better toe traction while climbing. The same principle allows you to really bound downhill, heels digging in and stabilizing your gait while shedding elevation on steep terrain. The inflated shoes have a bit of a spring to them, making each step feel like you’re literally bounding from step to step. 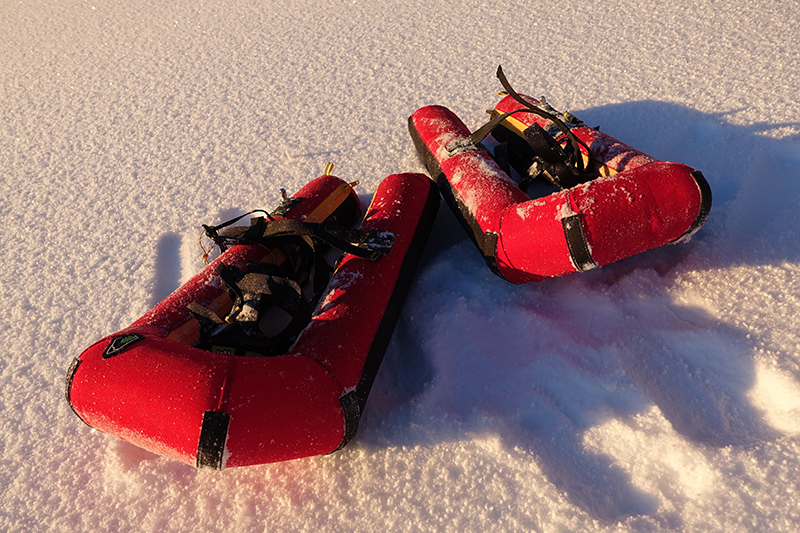 At 90 seconds, the shoes inflated much faster than we expected and are easy to strap into, even in deep snow. Once inflated, the lofted shoes supported both me and my loaded pack — around 200 lbs. 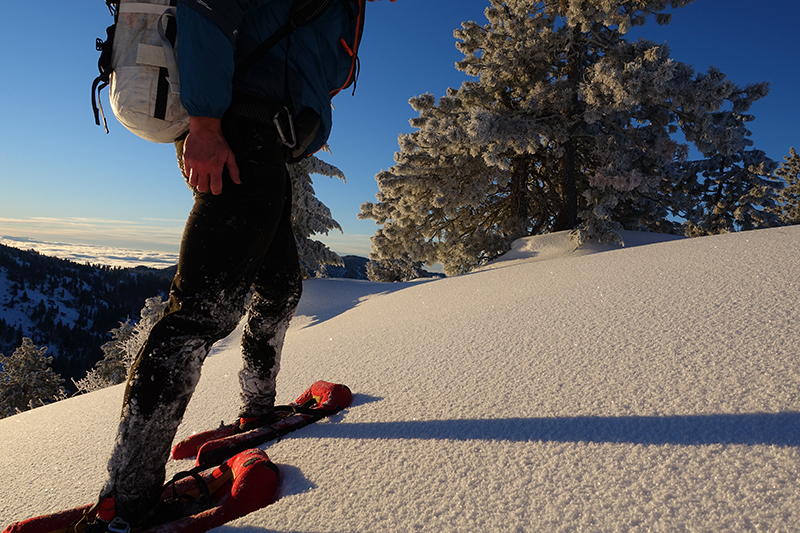 The inflatable shoes pack down better than any snowshoe we’ve ever seen and the company has a variety of aftermarket bags that service everything from the casual hiker to the extreme base-jumper. Finally, you get some bang for your buck. 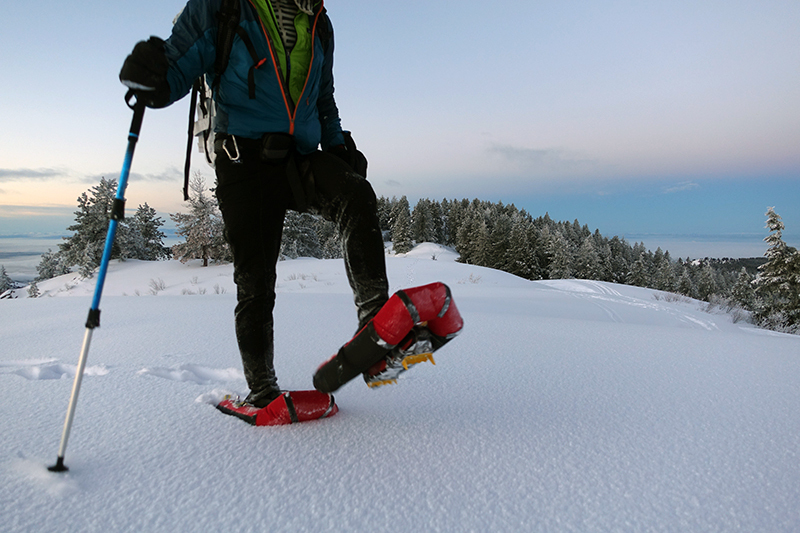 At 21 ounces and $200, the shoes are on price-par with the lightest snowshoes on the market. The included bike pump is off-the-shelf ‘meh.’ It works (faster than we thought! 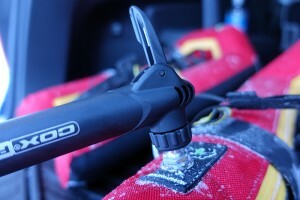 ), but we’d love to see a dual-action pump that inflates during both the push and pull cycle. Small metal objects are no fun to fiddle with in cold temperatures. Digits are clumsy and you don’t want to stick a small metal cap (that protects the inflation valve) between your lips. These things could easily get lost in the snow. We’d love to see more nylon, hard plastics, or coated metals used on the shoes. To maximize the shoe’s float, the horseshoe-shaped tubular hull trails off the back of the foot on both sides. This forces your gait into a wider-than-natural stance and results in the occasional overlapping rub between the shoes. I eventually adjusted my gait and didn’t notice any negative effects. Whether this adjustment would cause negative results from extended hikes… I didn’t test it long enough to tell. 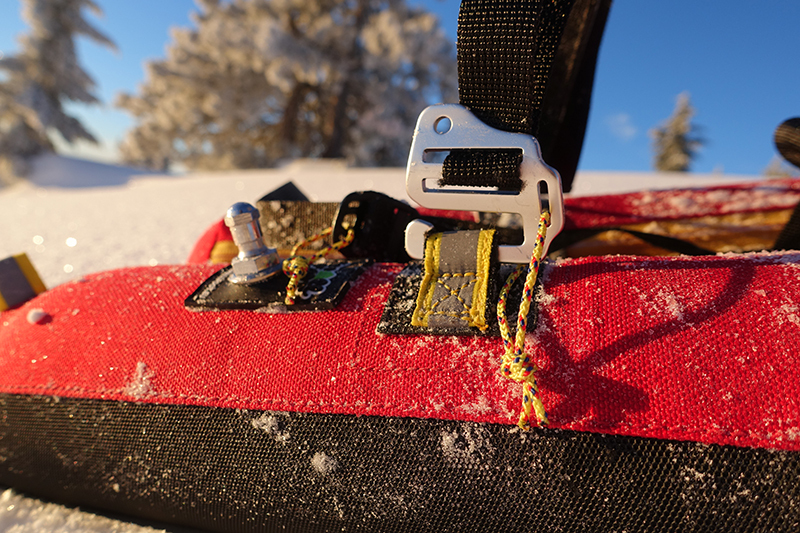 To help remove the cinched straps, the aluminum clips have a simple light-weight cord. Pull the cord, and the strap is released. Again, it works, but it feels cheap. For $200, we’d love to see something a little more robust and purposeful by design. 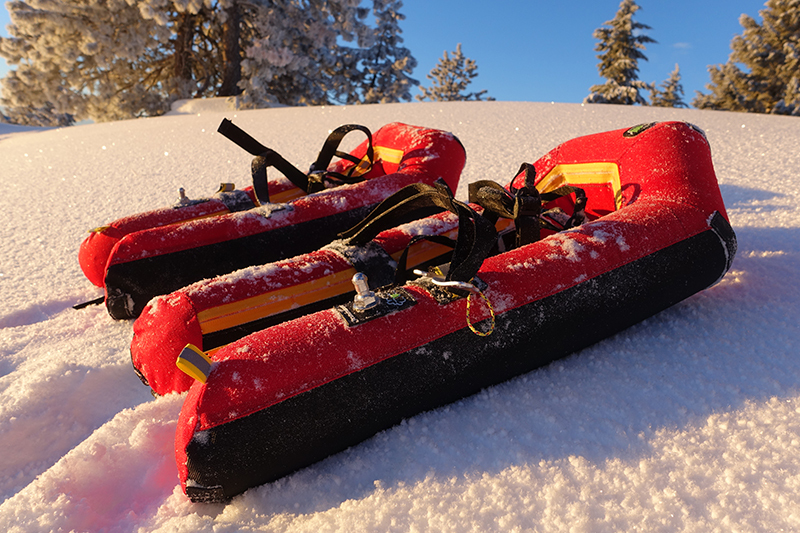 Probably the biggest question is: How durable are inflatable snowshoes? The idea of tromping deep into the woods on an inflatable base might inspire a second thought. The Cordura is exceptionally robust and videos on the Small Foot site show German Shepherds wrestling with the snowshoes. We tested the shoes in a more mundane way, bashing through exposed branches and rock. We saw no signs of wear. And even if you managed to step a crampon on the shoe, the Cordura would deflect the point. That said, the shoes are warrantied for 2 years, covering manufacturing defects from normal use. The real weakness is perhaps the zipper that entraps the air bladder inside the Cordura sleeves. Blow a zipper and your plans could also quickly deflate. But for intended use on appropriate terrain, they should last well beyond the two-year warranty. The billing of “pocketable” is perhaps overly optimistic. I can’t see compressing these into any pocket other than the two provided with the pair. And even these bags are best strapped to the outside of your pack. But the shoes pack down smaller than anything else we’ve seen on the market. If the space race is your kit’s final frontier, Small Foot’s inflatable shoe is worth considering. Check out Small Foot for more information or to buy now.